This video was created in January when I was a guest speaker at a panel discussion organized by Jordan Hesterman, leader of Becoming We the People. I hope you'll look at it, share it, and integrate the message into your actions. You can find more videos like this here and more maps on this site. In last Sunday's Chicago Tribune I saw a Perspective written by Clarence Wood and Bruce Hatton Boyer. The title was GETTING REAL: Post-World War II vision of the American dream -- it's over. I encourage you to read and reflect on this. One conclusion of the article was "we need to understand that the new minority in this country is defined not be skin color or religion but by bank balances. People are not poor because they are Latino or African-American or Caucasian. They are poor because they have not had the right opportunities to advance themselves. And they will remain poor until we decide to give them the schools and community organizations they need – everywhere, not just the ones in our comfortable suburbs." It went on to say "We cannot continue to ignore our inner cities because rebuilding them also helps our affluent suburbs by shifting our precious economic resources towards future ventures." It ended with "In short, we must face the fact that we are dependent on one another – governmental bodies, not-for-profits, corporations and small businesses as well as the arts and cultural communities. We always have been and always will be. If we don’t get over our ideological rigidities and roll up our sleeves, we will fall into the trap Benjamin Franklin acknowledged as he signed the Declaration of Independence. “Well, gentlemen, we must now all hang together, or we will surely all hang separately.”"
Then, also take a look at this blog article on the Seattle Social Ventures Partners site. It's titled "The Old Way to Collaborate. Where do Communities fit in?" This includes this statement: "Nobody wins unless everybody wins. Collective impact is sustained by balancing individual organizations’ self-interest with shared interests. Collectives that build a solid foundation of trust and mutual benefit from their shared efforts are more likely to maintain commitment to the group and reinforce activities that meet the group’s objectives." Doesn't this sound familiar to what Clarence Wood is saying? This Tutor/Mentor Connection video shows how a tutor/mentor program is a collective action, involving the volunteers, students, staff, leaders and donors in a common goal. 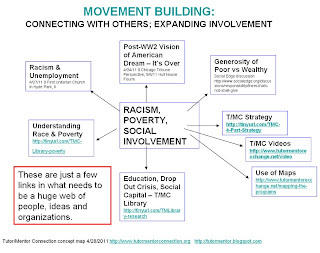 This video shows events organized by the Tutor/Mentor Connection since 1994, intended to draw leaders, volunteers and donors from throughout the Chicago region together in collective actions where WE ALL WIN and every poverty neighborhood benefits. 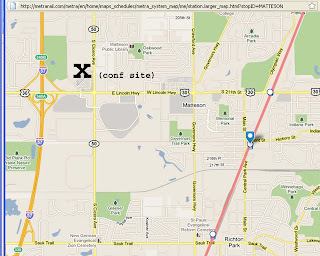 The May 19 and 20 conference in Matteson, Illinois is part of this event strategy. If you attend, or send a contribution to help pay for the event, you're making a statement of support for this collective effort. You're helping provide a spark that moves us from the end of this school year to the start of the next. Everyone who reads this can be the spark of a chain reaction that reaches people throughout the Chicago region, and the rest of the world. Take that role daily and we can create a new future beyond what is now forecast for us. 2-16-2017 update - Video titled "Crossroads: Labor Pains for a new Worldview" shows how much we are all dependent upon each other. View and add comments. 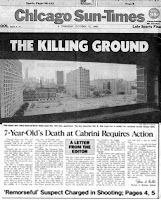 In the fall of 1992 a young boy name Dantrell Davis was shot and killed in Cabrini Green. 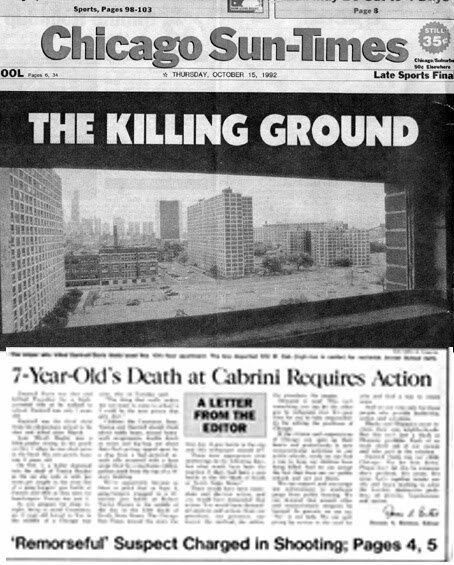 I've posted this image of the front page on my blog often and used it as a reminder of a commitment I and the founders made during the weeks following this event, as we created Cabrini Connections and the Tutor/Mentor Connection. Over the years we have realized that we had two "brands" and that many people did not understand the Tutor/Mentor Connection and why it was important to Cabrini Connections and every other tutor/mentor program in the Chicago region. 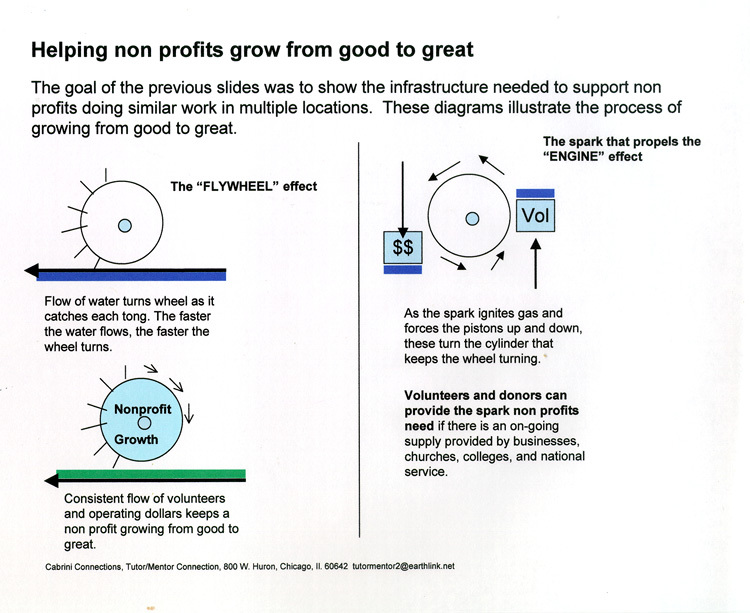 I've created PDF essays like this to try to educate donors, and our own volunteers and leaders. Because we have not been able to attract philanthropic investors to provide consistent support for the Tutor/Mentor Connection, the burden of raising funds has been with the volunteers and leaders of Cabrini Connections. It has been a single small tutor/mentor program trying to support the infrastructure needed to support all tutor/mentor programs in the entire region. A big challenge, and ultimately, too much of a burden. Our funding challenges of the past decade and changes in leadership have finally caused the Board of Directors to decide to focus only on the Cabrini Connections part of the organization. I will be reforming the Tutor/Mentor Connection into a new organizational structure that I hope can do a better job of attracting investors and philanthropic support so we can have a greater impact in Chicago and share this impact in other cities. If we succeed, it will do more to provide support to Cabrini Connections and its students, volunteer and alumni, than if I stay with the organization for another few years. We have a unique opportunity. The T/MC is recognized in many parts of the world and appreciated by many. 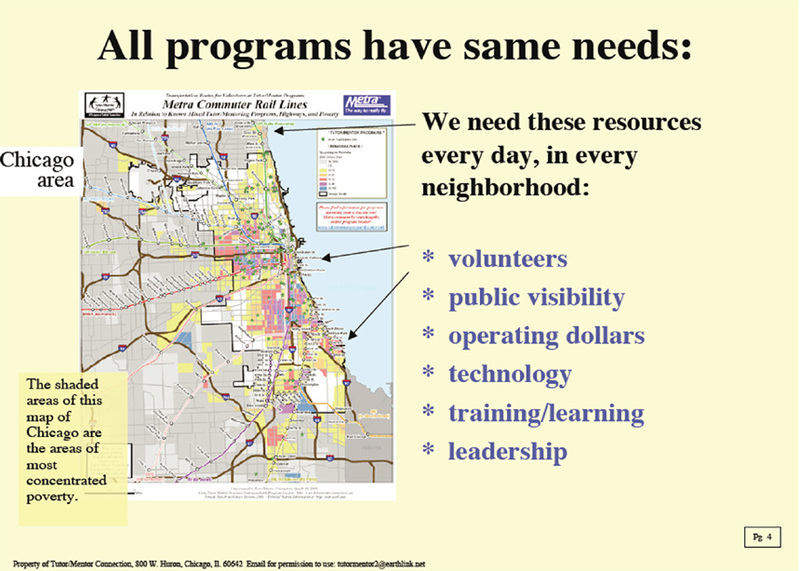 The web resources including the Chicago Tutor/Mentor Program Locator and on-line documentation system are unique, and not available in this format or strategy in any other city. The year round event strategy and web library have been developed over a period of 18 years. It would be impossible, or financially improbable, for any city or any group in Chicago, to rebuild this from scratch. Thus, a new structure may enable us to find the capital needed to fully develop these resources and to make them available in more places than Chicago. That structure is not yet clear. Instead of starting a new organization, we could move under the umbrella of another organization, or a university, or even a city like Chicago. However, if you know me you know that I have a wealth of ideas that only need volunteers and/or investors to bring them to life. By mid July I need to find donated space from which to operate, and a team of volunteers, advisers and supporters in place. Thus I'm inviting any current and/or former Cabrini Connections volunteers and student alumni, as well as those I have connected with via the T/MC network who value the Tutor/Mentor Connection and have an interest in helping it move into the future to email me at tutormentor2@earthlink.net to offer your ideas. To learn more about the goals and activities of the Tutor/Mentor Connection, review the essays in this Tutor/Mentor Institute web site. Follow this blog over the next few months to see this exciting new structure develop. Last Thursday evening I attended an event at the Boeing Corporation HQ in Chicago hosted by NetImpact Chicago. The focus was Corporate Social Responsibility. There was no overlap in participants in these meetings. 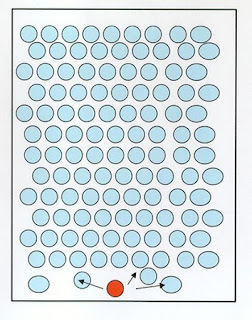 Thus the ideas shared in one group and the second group are not connected....at least on the surface. However, since I point to both groups in this article, and with the links on the Tutor/Mentor Connection web site, and via invitations to the May 19 and 20 Tutor/Mentor Leadership and Networking Conference, they and others like them do have the potential to connect through the work I do. 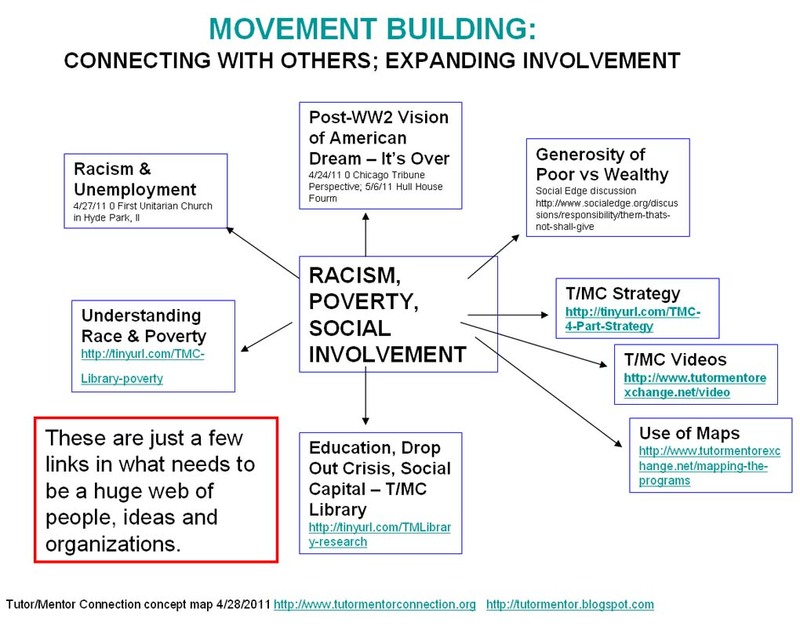 I have developed graphics in the past to illustrate how my goal is to build connections between different groups who focus on issues important to the mission of the Tutor/Mentor Connection. By sharing links and organizing networking events, we not only invite people to connect with T/MC, but to connect with each other. The chart below is an example. The ideas shared by the NetImpact speaker were important to me and should be important to anyone working to help create social justice in America and the world. The Business Community needs to be strategically and morally involved. Yet to me, the talent and time of the NetImpact volunteers who attended the event is even more important. In 2007 a Net Impact fellow started this Business School Connection wiki. In 2010 a team of Net Impact volunteers started this comparison of the T/MC to mentoring partnerships around the country. If just one person volunteers to help T/MC as a result of my attending, that would be a great success. If they just visit our web sites and start learning what we're doing it would be a success. I attended four workshops yesterday at the eChicago event. I was impressed with Matthew Guilford's vision for what the City Of Chicago seeks to do to create public computer centers and a digital youth network. I think T/MC could help in this area. I also found the discussion of eBooks to be valuable. One statement saying that "1/3 of kids read more with eBooks" suggested that this would be a great tool in non-school tutor/mentor programs if volunteers learned to mentor kids to use ebooks, and helped raise the money to make the eBook Readers more available in high poverty areas. I encouraged speakers to present information about ebooks at the May 19 and 20 conference. The discussions of "libraries as places for community learning and collaboration" is something I've been interested in for a long time. 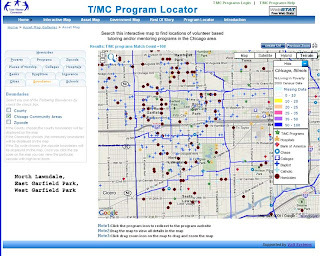 Chicago libraries were using the printed T/MC program directories in the late 1990s. I attended a session on libraries at the 2008 eChicago event. I think T/MC ideas would be a valuable resource for area libraries. I would love to be able to provide training for them to use the Program Locator and to help them build T/MC support strategies from each library. Another workshop was Joel Rubin's description of technology changes at the National Association of Social Workers Illinois Chapter. It parallels the movement to a web-based strategy by the T/MC over the past 12 years. This is another group I'd like to connect to tutor/mentor programs via the May and November conferences and on-line forums. The last workshop of Friday was one talking about Technology and Revolution. Speakers talked about how social media has been used to spark and sustain revolution in the Middle East and North Africa, and in Wisconsin. Some of the speakers were fervent in the belief that a greater social revolution is coming. I resonate with part of this because my own goals are to revolutionize how non profits are supported so better k-16 tutor/mentor programs are in more places for more years of consistent growth and improvement. 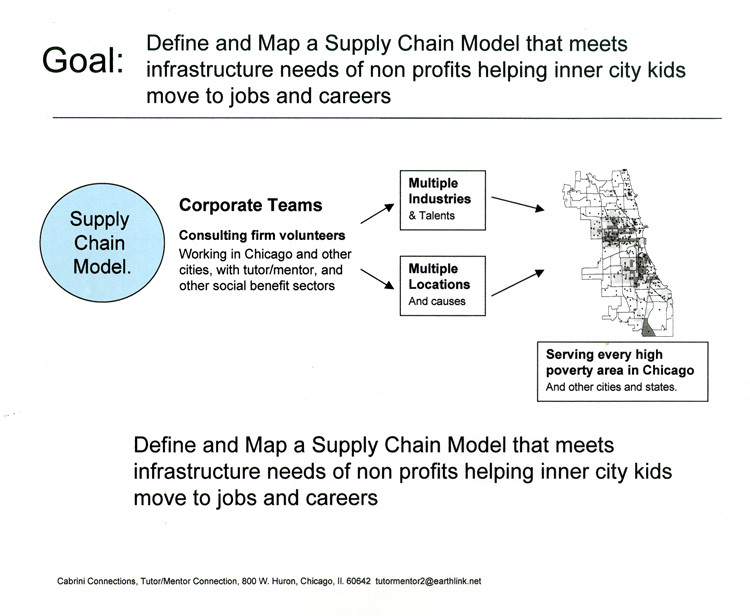 You can connect with eChicago on Twitter @eChicago2011 and with NetImpact on Linked in. 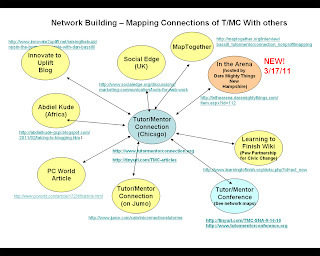 You can find links to each of these and many more in this blog and in the Tutor/Mentor Connection library. My hope is that the people from these forums and many others will find ways to continue to meet in on-line forums and face to face events, and that I can find time to join with them. We can all use these new technologies to map out collective actions that lead to revolutionary change...and to a better world once the revolution is over. I attended an Advertising & Public Relations Reception at Loyola University Chicago last night. I was not quite sure what the event would include beyond “free wine” but was really please with the result. First, this event showcased work that teams of Loyola students in Kay Felkin’s advertising and PR class had done since January to support five small non profits in the Chicago region. One of Kay’s students was Jordan Merlo, who was an intern with us a year ago. In early April I was a guest speaker and presented this information to Kay’s students. So I was really pleased to be invited to see the work the students had done. Second, this was a competition! The students were competing for The Ebeling Pr-ize not just for an academic credit. The winning student team received a $2000 award from Chuck and Vicki Ebeling, along with a signed letter of recognition for the success the campaign achieved on a professional level. I was introduced to Chuck and Vicki during the networking part of the event and they were very polite in listening to what I do with the Tutor/Mentor Connection. However, it was not until Mr. Ebeling spoke that I realized that he was a founding member of the McDonald’s Global Communications Council and what the purpose of the event really was. It totally related to my own goals and strategies. Mr. Ebeling talked about how prizes and competitions have the potential to change the world and he described the Orteig Prize as an early example and inspiration for his own efforts. The Orteig Prize was first announced in 1919 by Raymond Orteig, a French-born New York hotelier. It offered $25,000 for a pilot to fly nonstop between Paris and New York. The Orteig Prize is what inspired Charles Lindberg to become the first pilot to fly nonstop between Paris and New York City in 1927. The result was a transformational event that led to the airline industry as we know it today. I did some research on this today and found this Innovation in the Crowd web site that provides more information about the Orteig Prize, and also provides extensive information that can be used in creating competitions like this. I see competitions as one strategy to draw more attention to the ideas we share on the Tutor/Mentor Connection web site and to draw more consistent visibility, volunteers and philanthropic support to tutor/mentor programs throughout Chicago. I also see it as a way to earn income to support the T/MC efforts. The graphic below illustrates how a competition at key times each year could be a "spark" that motivates more people to get involved, or stay involved, with volunteer based tutor/mentor programs. Competitions and awards that recognize people and businesses for how they support one or more tutor/mentor programs could provide such a spark. So could competitions that recognize teams of students and/or volunteers for work they do to help the T/MC increase the reach and frequency of its communications. For instance, I’ve had the idea of a Business School Connection on the drawing board for more than a decade. This wiki was created by a University of Chicago NetImpact fellow in May 2007 but I’ve not found other volunteers or sponsors to help move the idea forward since then. In this article, I show work interns are doing of converting illustrated essays into animations and videos and the potential that this could be a competition involving students from all over the world. He’s right. However, the people I met at this reception, and the information I’ve found about using prizes to inspire innovation, are more fuel for my efforts to add these competitions to the Tutor/Mentor Connection’s year-round strategy. 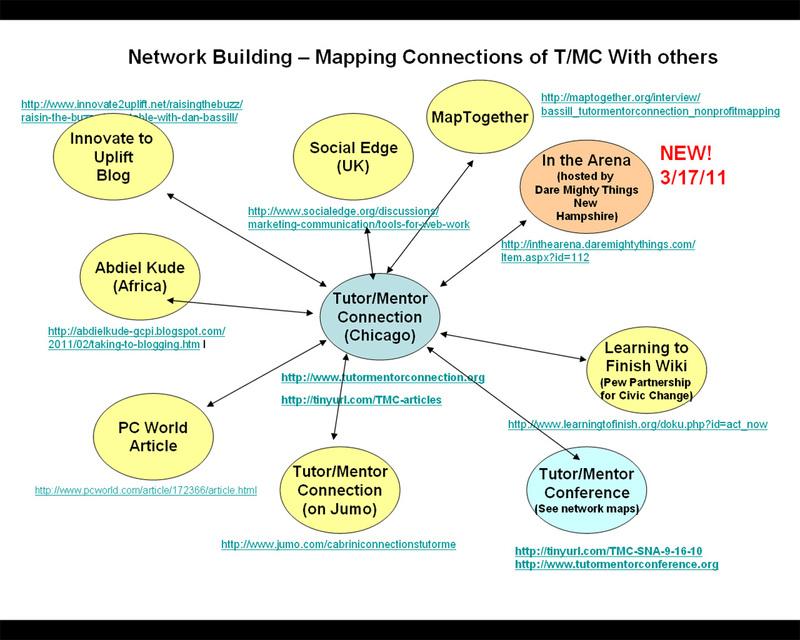 The Tutor/Mentor Connection hosts a May and November Conference as well as an Aug/Sept Chicagoland Volunteer Recruitment Campaign. These are part of an ongoing effort to build more visibility and draw more volunteers and donors to all volunteer-based tutor/mentor programs in the Chicago region. We have had limited success in building partnerships with corporations, yet this blog shows 10 reasons why corporations should invest in cause marketing. Why not become a partner with the Tutor/Mentor Connection and support your own workforce development interests? I was invited by my friends at Give Forward to participate in a blog series they are hosting at in honor of World Give Day <http://www.worldgiveday.com/ > . World Give Day is an annual day of giving that encourages people to give whether it is a donation, their time, or even a hug. The goal of this day is to encourage the culture of giving. Since I’ve led an organization for 37 years that has depended on the contributions of time, talent and dollars from many people, I’m delighted to write about this. 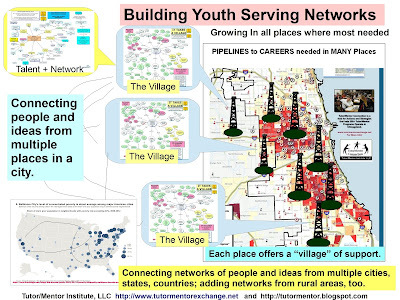 In fact, I’ve been writing about the challenges of making mentor-rich non-school tutor/mentor programs available in hundreds of locations for the past 18 years in my role as leader of Cabrini Connections and the Tutor/Mentor Connection. I hope you’ll take some time to read some of the past articles. The challenge of a non-profit leader is the same challenge I had as an advertising manager of the Montgomery Ward Corporation, yet larger. At Wards during the 1980s we had a $250 million advertising budget to reach out to 20 million people three times each week with advertising intended to draw customers to our 400 stores located in 40 states. In these ads we provided a range of merchandise and services that we knew some people were looking for each week. We also provide incentives to motivate people to come to our store instead of someone else's store. These included HALF PRICE, NO MONEY DOWN, LIMITED TIME ONLY and many similar messages. In the non-profit sector each organization competes with each other on a daily basis for dollars and volunteers and public attention and few have the advertising budgets that are available in for profit corporations. At the same time as they are searching for dollars to pay the expenses they also are innovating ways to use the dollars effectively to provide public benefit. Few non-profits have the ability to say HALF PRICE SALE, or THIS WEEK ONLY. Thus most don’t have the consistent involvement of volunteers and donors that are essential to build and sustain the work each program is trying to do. That’s why events like World Give Day are important. Someone is taking the lead on May 4 to motivate people all over the world to seek out a charity to support. Give Forward is taking an important role by encouraging bloggers to write about this, thus expanding the “advertising reach and frequency” that is needed to attract the attention of millions of people who might make small donations of time, talent or dollars to fuel the work of a non-profit. Give forward is taking an important role. They support giving by small scale donors by being a portal that enables donors to set up campaigns to raise money for health related causes. They support those donors by helping raise visibility for giving, through blog exchanges such as this. We’ve used GiveForward.org in the past two years to raise more than $40,000 for Cabrini Connections, Tutor/Mentor Connection from hundreds of small scale donors. The Cabrini Madness campaigns empower our students and volunteers to be advertisers who tell the ‘tutor/mentor story” to friends, family and co-workers. 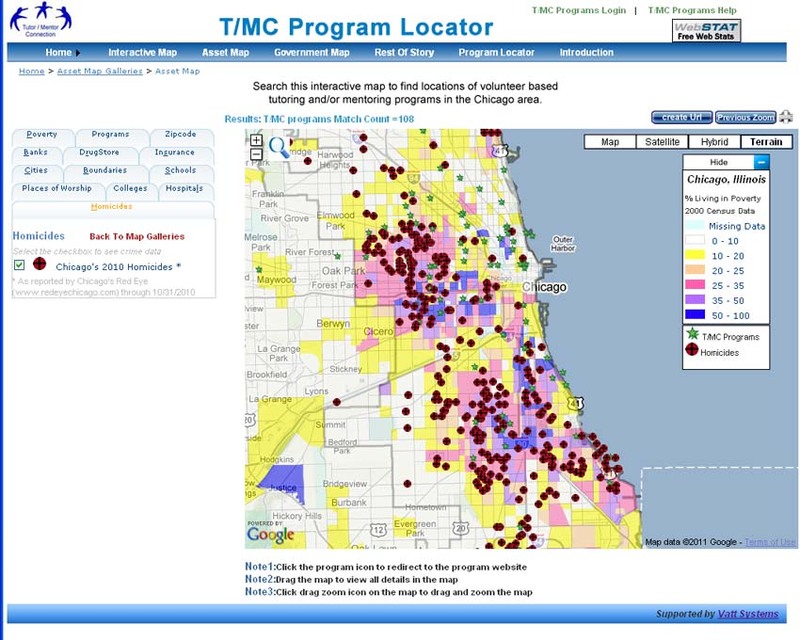 The Tutor/Mentor Connection supports the involvement of volunteers and donors by maintaining a map-based Directory of Chicago organizations that offer various forms of tutoring/mentoring in different neighborhoods of Chicago. 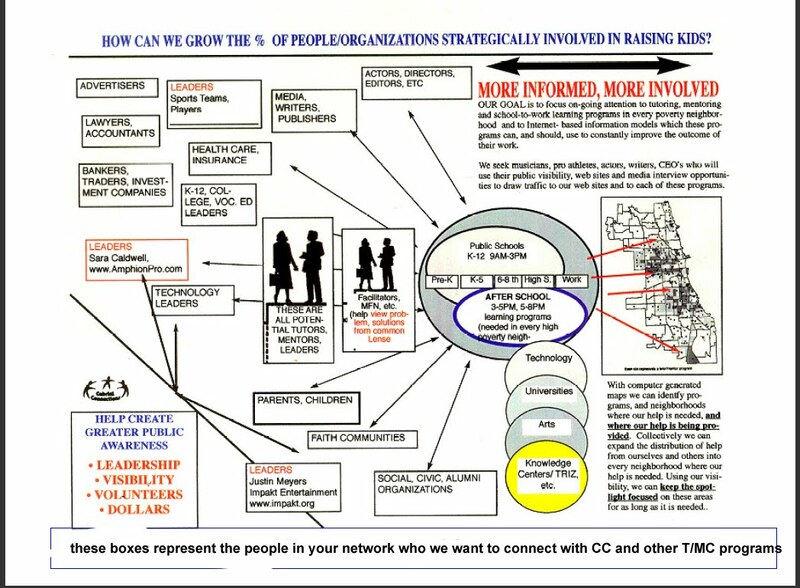 T/MC also hosts a library of links to web sites of these organizations and to information that people can use to understand why and where tutor/mentor programs are most needed. We don’t yet have a giving feature tied to the maps that works like Give Forward, but we’d like to add this if we can find the money, or a technology partner. If World Give Day and the weight of many bloggers can draw a few more donors to the t/mc directory, some of those will end up adding new funds and talent to help Cabrini Connections, as well as many other tutor/mentor programs in Chicago. However, it will be even better if the following happens. b) Some of these groups will see the value of map directories and portals like the T/MC and will add their own time, talent and dollars to help innovate more ways that we can draw volunteers and donors directly to programs, the way mass merchants draw shoppers to stores. Help us build this capacity and help us share this with people in other cities. Margaret Mead talked about how a “few people can change the world”. Events like World Give Day can reach millions of people and inspire them to spread their time, talent and dollars to all corners of the earth where they can become part of the few, the proud, the difference makers. While I've just learned to create and post videos to share my ideas, I'm awed by how much talent and creativity other people are able to apply in sharing their own ideas. This video not only has some challenging thinking, but demonstrates creative communications and visualization at its best. If you're a donor/investor who would like to become an executive producer on our videos and other web essays, you can help us hire the talent needed to do this work. While newspaper stories can draw tremendous attention to a problem, they don't work like advertising to draw shoppers to retail stores, fast food outlets, banks and other businesses that have locations in many places. Since volunteer-based tutor/mentor programs are needed in many parts of Chicago, the Tutor/Mentor Connection has built a strategy aimed to draw volunteers and donors to every tutor/mentor program on a more consistent basis. Since we don't have big advertising budgets (or a small one) this strategy depends on the ownership by many people and organizations. Take a look at the video then visit the T/MC web site and play this and other videos and animations. Once you've reviewed this and the animations on the T/MC site, visit the section that shows roles leaders in business, universities, hospitals and faith groups can take to help tutor/mentor programs grow in more places. These were created by interns who we coach using the Tutor/Mentor Connection forum on Ning. If you'd like to help create projects like this, or re-do these videos with higher quality film-making, please join us. None of us can do as much working alone as a few of us can do by working together. On the Tactical Philanthropy Blog there's an article showing how a creative product manager and talented advertising agency turned carrots into a "junk food" and increased sales. In the graphic below I show how consultants working at Accenture and similar companies could do a better job of enlisting business support for tutor/mentor programs because they are already working as trusted partners with these companies and involved in helping them find new ways to sell their services. If we can recruit volunteers and ad agencies who will create campaigns that draw volunteers AND donors to volunteer-based tutor/mentor programs, and to the Tutor/Mentor Connection, we can increase our sales, too. In this case we increase our ability to keep kids and volunteers connected. Read more about the role of talent volunteers and consultants in this pdf essay. If you've got this talent and you want to help us, email tutormentor2 at earthlink dot net or call 312-492-9614. The Tutor/Mentor Connection seeks to connect for profit and non profit organizations who are working to help kids in high poverty areas get more support to move through school and into careers. There are many for-profit tutoring centers and some have asked to exchange links with me or to be listed in the T/MC web library. I turn down most of these because it's a one-way street. If you visit the web site they don't do much to help volunteer-based tutor/mentor programs operate, and thus poor kids have a harder time getting their services. I connected with one group called Parliament Schools recently and had a slightly different experience. My initial negative response led to a conversation, which resulted in being introduced to the Kids With a Promise Program in New York City. I'm happy to write about business groups who are actively trying to help us build the Tutor/Mentor Network. I encourage you to visit the Parliament Schools web site to see how they have "recently launched the Parliament Scholars campaign to help prepare students with high-potential and financial need for the SAT & ACT exams." There are many people in business doing things that support volunteer-based tutor/mentor programs. I'd like to find a partner who would help us aggregate information about these companies and create an annual award that might recognize the ones that are doing the most. If we can make this award visible and show what that company is doing, maybe we can show how others can do as well or better. On a year-to-year basis that could stimulate a growth of good practice in every industry. Who wants to sponsor this idea? The church is easy to reach via automobile or by taking the Metra Electric Train toward University Park. Exit at Matteson. See train schedule and information at this link. We now have the conference registration page live, and an attendee list that shows who has attended past conference and who will be attending this one. You can click on a name and send a message to any participant to stimulate your own network-building. Note: some of the email links to past participants are probably broken by now. Today's Chicago SunTimes had a great column by Neil Steinberg showing how Rahm Emanuel has had a potentially life-changing impact on a 13-year old inner city boy. As you read this, please look at articles I've written that talk about helping more than 200,000 youth living in inner city neighborhoods connect with mentors and tutors like Rahm. Then, look at the video below. Imagine how many more tutor/mentor programs would be available and how many more youth would connect with mentors like Rahm, if he and other leaders were using the Tutor/Mentor Connection strategy as their own. See more ideas by reading the articles on this blog, or visiting the Tutor/Mentor Institute site and reading the essays we've posted. 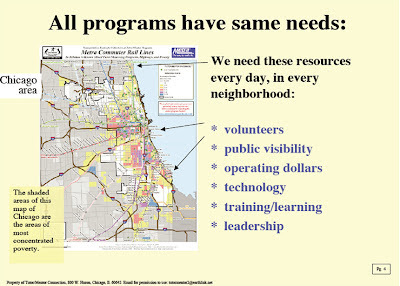 While these ideas focus on Chicago, they can be applied by any leader, focusing on any city. Contact us. We'd like to be your partner. 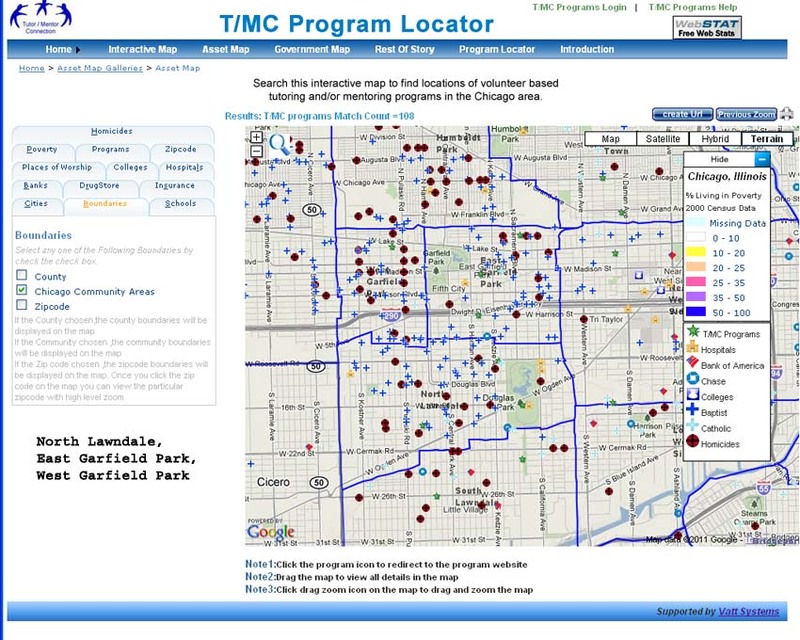 In the past few years I've written many articles and included maps that we've created using donated ESRI software, or created using the interactive Chicago Tutor/Mentor Program Locator that we launched in early 2009. Here's an example of what you can do with the Program Locator. This map shows high poverty areas of the Chicago region (based on 2000 census) and also shows locations of low performing public high schools. The green stars on the map are organizations on our database that provide some form of tutoring and/or mentoring in non-school locations. Click on a green star to see the name and web site of the organization. Now we've added a new layer of information, showing 2010 homicides in Chicago, to the map (when you click on this link you will see a tab on the left saying "homicides. You need to open that to add the homicide data to the map.") . I've also sorted to show the number of programs serving high school age youth. You can see that poor schools, high homicide rates and high poverty align. These are areas where there needs to be high quality, mentor-rich tutor/mentor programs. While some of the programs in our database might be considered among the best in the world, others may need help becoming that good. They all need a constant flow of operating and innovation resources if they are to maintain a high level of service, or improve what they are doing. This next maps shows how we can zoom into a section of the city and enlarge the map so we can see more detail, or so we can create a map that could be posted on a blog like this, as an invitation for all of the assets shown on the map (banks, churches, hospitals, tutor/mentor programs) to come together to share ideas and find ways to help high quality tutor/mentor programs and other youth and family services grow in all parts of this map area. Students at area high schools and colleges could be creating maps and writing stories like I'm writing if someone were to introduce them to this resource. However, that may not continue to be possible in the future because the Tutor/Mentor Connection does not have the money to keep offering this service free to Chicago and its suburbs. Without philanthropic investors stepping forward we cannot update the information on the maps, improve the technology, or continue to write articles like this to draw your attention to the maps and to show you how to use them. If you or your company or foundation would like to support this service, or make it available in a different community than Chicago, please call 312-492-9614 or introduce yourself with a comment on this blog. I posted a blog article on the Cabrini Connections blog today, inviting our volunteers to join in the planning that results in a 2011-12 school-year program that builds upon what we've learned in the past year and what we've learned from others who also lead tutor/mentor programs. As more people become involved in the research and planning that leads to program improvement from year to year, the Tutor/Mentor Connection hosts a wealth of information that anyone can use to expand their thinking based on what they can learn from others. The graphic below shows that our information divides into four categories. 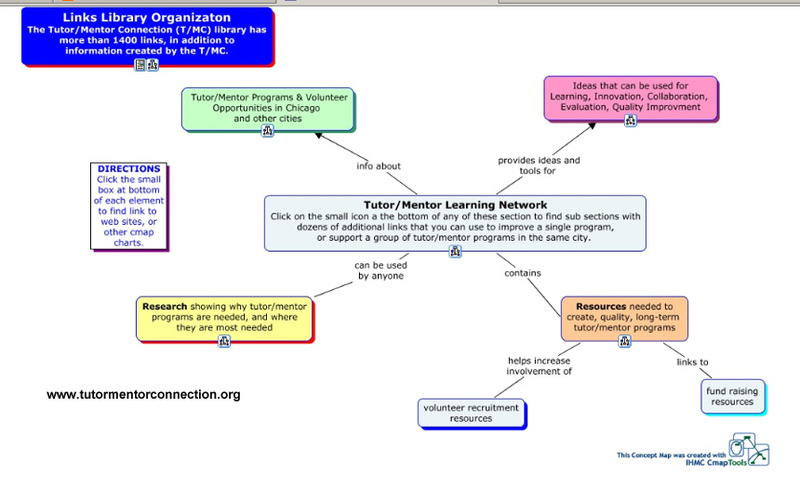 Service Providers - this section of the library points to web sites of various types of tutor/mentor programs in Chicago. It can be used by volunteers, parents and donors to find programs to join. It can also be used by planners to learn what others are doing and to borrow ideas that they feel can enhance their own program. Research articles/links - this section of the library points to dozens of other web sites with information that shows where tutor/mentor programs are most needed and why they are needed, based on poverty, education issues, social justice, etc. 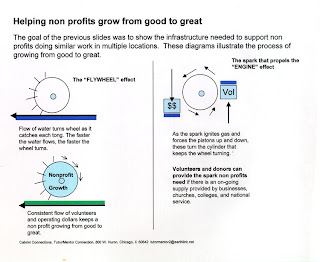 Resource building articles - every non profit needs to be good at many different types of work in order to be able to recruit and retain volunteers, find consistent funding, evaluate the work they are doing, communicate effectively, etc. The links in this section point to a wide range of information that can be used by any non profit, not just tutor/mentor programs. Process improvement, collaboration, knowledge management, innovation - if I were starting a school, or teaching a college class on non-profit management, I would point my students to the links in this section of the T/MC library and encourage them to learn and master the various concepts. These are the core skills, or building blocks, needed by effective people and effective organizations. Because the Tutor/Mentor Connection is so small we don't have the manpower to teach these subjects, or to do as much as we'd like to help others learn what's in the library and how to use it. We are constantly reaching out to other groups who might help facilitate an understanding of this information. This blog by DePaul University students is an example of what is possible. We host a Tutor/Mentor Leadership and Networking Conference in the Chicago region every six months. When we organize these we send invitations to people who we have linked on our web site. The conference, as well as the articles section of the T/MC web site, offer an opportunity for all of these organizations to connect and network with each other. 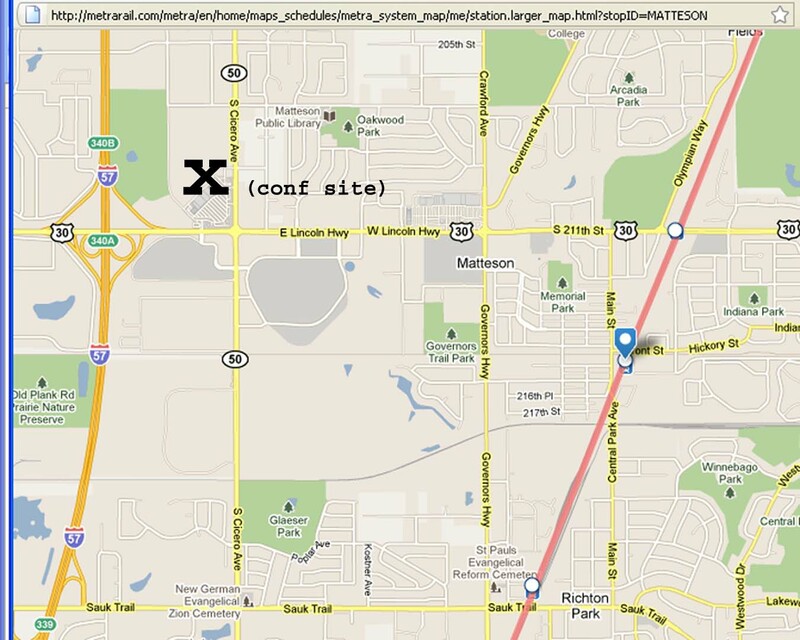 We're hosting the next conference on May 19 and 20 in Matteson, Il. While one goal of this conference is to celebrate the work that has been done by tutor/mentor programs over the past year, another is to have people share what they do to build effective programs. Another goal is to encourage program leaders and supporters to think of ways they can work together in August 2011 so that more advertising and public outreach is created, drawing more volunteers to all of the different tutor/mentor programs operating in the region. 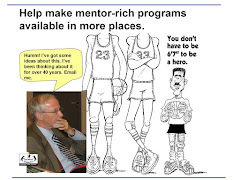 If we are thinking of what it takes to make a good tutor/mentor program available in the 2011-12 school year, one of the things we all need to be thinking of is how to attract volunteers and donors. If we wait to start working on this in July or August it will be too late to innovate new ways to create bigger impact and have a greater influence on volunteer response. If we talk about topics like this now and during the May conference, we may be able to do new things to help tutor/mentor programs grow in the fall. That can help Cabrini Connections. It can help all other tutor/mentor programs, too. I hope some of those who read this will volunteer to host workshops and share what they know, while others will attend and learn from each other. 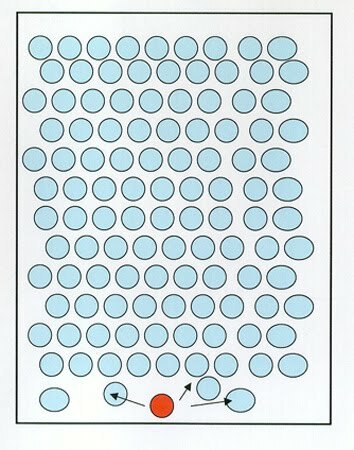 Interns from IIT and the University of Michigan have been creating animations that convert ideas written in this blog so that more people might view them and use the ideas. The video below captures the animated version and communicates it via YouTube. I hope you'll share this, and look at the original animation, and see how it was created. Then share this with leaders who will provide the operating resources to support volunteer involvement so that we reach the potential shown by this video. You can hear static in the background which came as I recorded this. I'm just learning how to do this. However, if you're a film major, or volunteer at a video production company or studio, and you want to take on this role as your own community service, or as a company sponsorship, I'd love to have you do these more professionally than I can. Dare Mighty Things has published a report titled Breakthrough Performance: 10 Emerging Practices of Leading Intermediaries. View the PDF here. Add your comments by joining the In The Arena Forum.